What a joy it was to serve in New Orleans last week with our partner Urban Impact! We joined with 40 others from 2 other locations to help with renovations on a 100 year-old church that will become a new youth center and hip-hop church! Not only did we paint, pound nails, drive screws and lay concrete, we were able to hear some great speakers talk about their lives and how they've been changed by the ministry of Urban Impact and the teams that come. 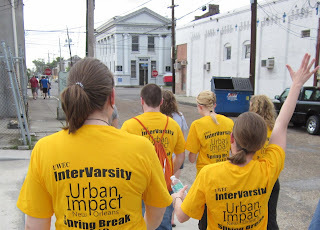 You can see some pictures of our work here: UW Eau Claire New Orleans Spring Break Trip! Everyone left a little of their heart in New Orleans, were challenged to think, speak and act differently, and developed some deep relationships that will continue into the future! Thanks so much to those who prayed and gave so that this group could go and serve. We know that there were many lives impacted by this experience! Stay tuned for another adventure coming soon! Last year's team heading to work! In addition to our little group, we've been helping to facilitate a larger group of 34 people from Cedarbrook Church Menomonie, WI to go and serve in New Orleans as well. The group is about half high-schoolers and half adults. 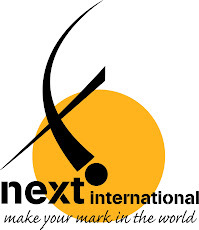 This effort continues the partnership between NEXT International and Urban Impact to help "create a neighborhood where its safe for kids to ride their bikes!" During this ministry time we will be working on renovations of a youthcenter/hip-hop church called "The Sanctuary" in the Central City area of New Orleans! We're anticipating a super fun and life-changing 9 days! Pray for changed lives (ours and those we meet) ... for a greater desire to invest our greatest and best resources to see "His Kingdom come and His Will be done!" In addition to this blog, you can catch up with us and some occasional updates on our Facebook page ... just search for NEXT International. Stay tuned! ... the adventure continues!